GREENGUARD® Gold certified. 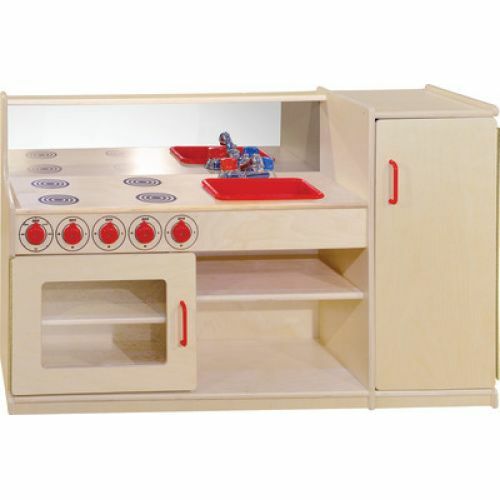 This 4-N-1 kitchenette is perfect for a little chef with big ideas who is short on space. 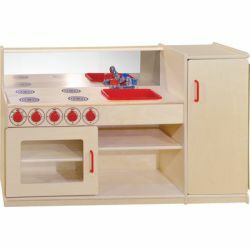 Features durable plastic handles, a range, fridge, oven and a durable plastic sink pan. The safety acrylic mirror allows tot chefs to watch themselves as they work. Constructed from 100% Plywood, and coated with our exclusive Tuff-Gloss™ UV finish. A recessed back for added strength, stability, and beauty. Fully rounded corners, edges, and doors for maximum safety. 29-1/16"H x 48"W x 15"D. Fully assembled. Lifetime warranty. Made in the U.S.A.